I’m amazed how quickly the holidays have come and gone this year. Things have been a little bit of a whirlwind since Thanksgiving. Danny and I had pretty much every weekend in December booked up with things to do and people to see, which was a nice, exhausting, and thrilling change for us. On New Year’s morning (nearly afternoon.) Danny and I took some time to reflect on 2017 and to talk about our goals. We realized, in the midst of our many personal challenges and worries about the craziness of the world around us, there were a lot of positive changes in our lives to be thankful for this past year. And that has given me great hope for this brand new year. Here are some crafty, fibery things that I’m proud and excited to have accomplished/taken part in during 2017, as well as the personal goals that they have inspired for 2018. 1) I taught my first ever eco printing workshop in early October. 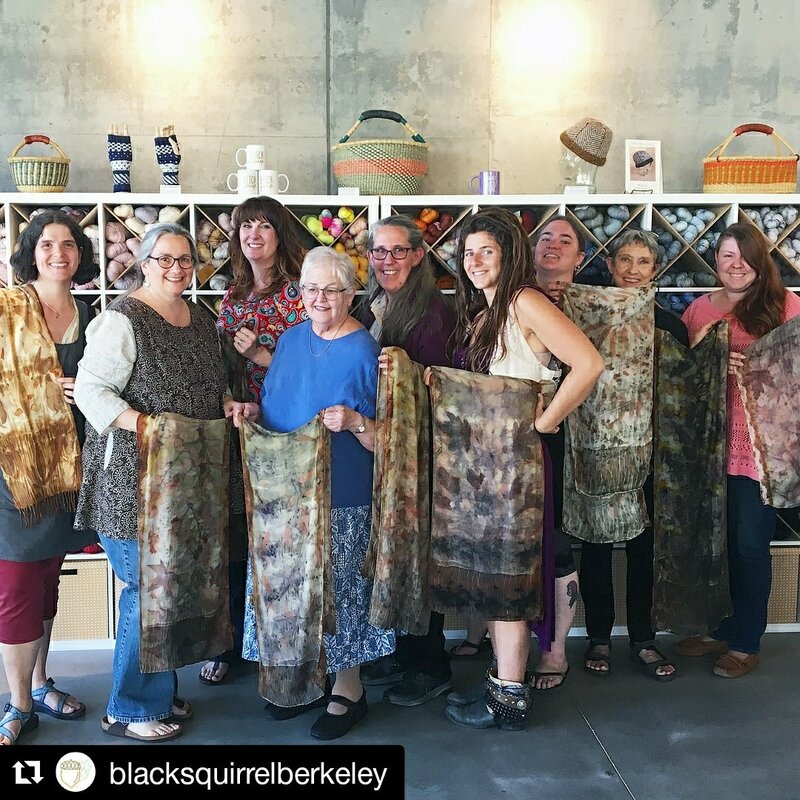 I had eight lovely students in my four hour class, which was held at The Black Squirrel in Berkeley. It was an incredible experience, and I am hoping to teach another workshop in late winter/early spring. 2) I have volunteered a few hours a month for a full year helping to teach knitting at the Berkeley Public Library. My passion for teaching knitting and crafts to others has only grown stronger, and I am looking forward to teaching more. Having this monthly commitment has also inspired me to be more active in the fiber arts community. Specifically, I would like to find a weekly knitting group that is a good fit for me and close to home. 3) I attended this year’s Knitting on the Coast retreat in Occidental, CA, which was incredibly informative and a lot of a fun. It is a real dream of mine to plan and lead a craft retreat of my own some day. It could happen soon, who knows? 4) Out of the sixteen knitting projects I have completed this year, five of them were apparel items: My stash busting Swing Dress, two tops, and two cardigans. One cardigan I knit for Danny, but the rest I made for myself to contribute towards my goal of making at least 25% of my wardrobe. My plan is to knit at least five more apparel items this year, in addition to sewing a new garment every month. Yep, I’ve got my work cut out for me. 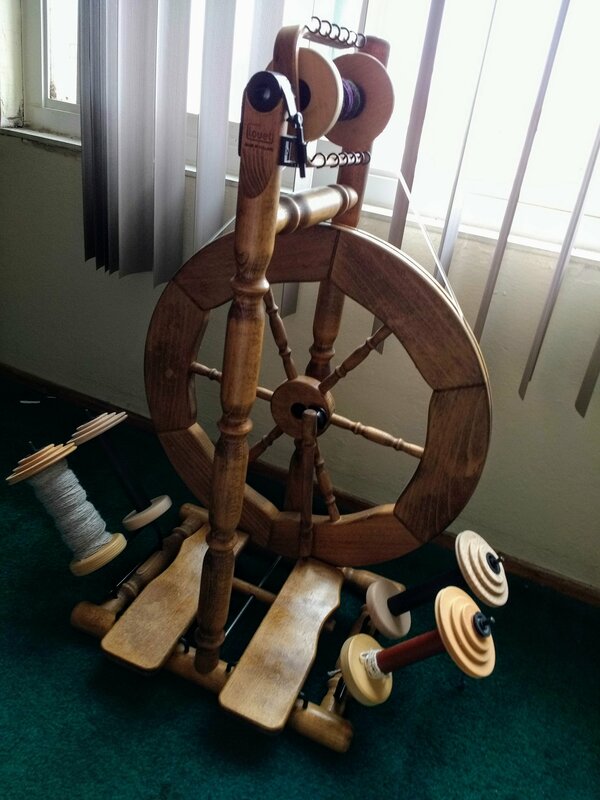 5) This summer, I purchased a used spinning wheel, a Louet S75 double treadle. Almost immediately after picking up my wheel, I participated in the 2017 Tour de Fleece event by spinning at least a few minutes every day for twenty-three days, which I was able to accomplish. I also took my first spinning wheel class with other spinners. This year, I am hoping to spin consistently for at least an hour or two every week, and to actually knit something substantial with the yarn that I spin. With the reflection of my 2017 accomplishments, my thoughts have also turned to my 2017 personal flops. Well, one big flop in particular. I am disappointed to realize that I have only written seven blog posts this past year. While I understand that everyday life can easily get in the way, it was not my intention to neglect this blog as I have. It is my biggest 2018 goal to write more, because I know that I love it just about as much as I love the fiber arts. Here’s to a New Year full of hope, promise, creativity, and compassion.